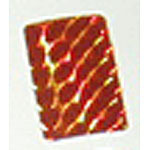 Amber (orange) hologram decal for drop target. Can be used on most makes/models. This large size decal fits most standard-size drop targets on Bally, Williams, and vintage Stern solid-state games. Measures 1-3/8 x 15/16 inches (24mm x 35mm). Can be used as replacements for original decals or to add some flash to any old or new game. Easy to install- just peel and stick.